This is Part 2 of our series called “The Holy Rosary is Not An Optional Devotion”. Part I can be found here. There are two things that helped me during my captivity. First, praying the Rosary. Mary, Our Lady, was always present and she helped keep me going from the first moment. Every time I prayed the Rosary, I felt an extraordinary peace in my heart. I cannot explain it. This priest apparently discovered through a real-life crisis, that through the Rosary, we have recourse to our Lady who intercedes for us with her Son. The Rosary is powerful indeed. Don’t believe me? Most of the Catholic Saints had a devotion to our Lady and the rosary. Here are some quotes from the Saints. One day, through the Rosary and the Scapular, Our Lady will save the world. Still not convinced? No need to believe me. Here are 15 promises made by our Lady to those who recite the Rosary. If you weren’t excited before about praying the Rosary, I hope you are now! No, the rosary is not “just another devotion”. Do you currently pray the Rosary? 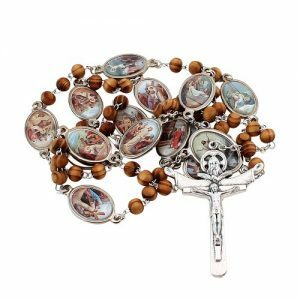 If you’re not sure how to recite the Rosary, check out this Rosary Prayer guide. May our Lady smile upon you. Powerful post. Our Lady of the Rosary, pray for us! I am a Catholic and I am try to say the Rosay every day, and I am beginning to see some positive changes in my life. The question is, can I say the Rosary when I have committed a sin? Absolutely you can and should, Charles. You should never stay away from God when you have sinned. That’s when you need prayer the most. If the sin is mortal, get thee to a confessional as soon as possible. In the meanwhile pray an act of true contrition and cling to God and Our Lady more than ever.